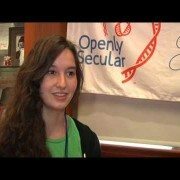 Malia is from Alabama, and she’s Openly Secular! Malia didn’t understand Christianity when she was growing up. Now, she is the President of the Secular Student Alliance at her college.